Durable Durastar Table Top Presenter A4 Landscape Black 8567/39 Pack of 1 Unique and distinctive portable display easel providing impact at all presentations exhibitions and training sessions. The rigid spine provides both strength and ability to file upright on shelves. With 10 pockets. Holds up to 30 pockets. A4 landscape. 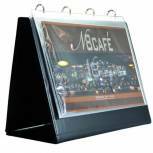 Monolith Leather Look Desktop Presenter Landscape A4 2798 Pack of 1 Leather look tri-fold A4 landscape easel binder. 4 ring binder mechanism. Front locking clasp. Supplied complete with 10 pockets. Capacity 30 pockets. W320 x D30 x H260mm. Durable Durastar Table Top Presenter A3 Landscape Black 8569/39 Pack of 1 Unique and distinctive portable display easel providing impact at all presentations exhibitions and training sessions. The rigid spine provides both strength and ability to file upright on shelves. A3 landscape. H360 x W450 x D320mm. 40mm spine.